If I am honest, had anyone asked me even a month ago if I had any kind of serious knowledge of or a relationship with St. Ambrose of Milan I would have said no. I should know better. When I start doing research into saints, especially those that circumstances have lead me toward delving deeper into than a quick review of their entry in the Menaion, I am almost always surprised by how much a saint has already touched my life. In this particular case, I have had a relationship with St. Ambrose for many years, though I have been grossly negligent for my part. For four years on an almost daily basis, I kissed the relics of St. Ambrose in the chapel of Holy Cross Greek Orthodox School of Theology. As I started to research into his life in preparation for this series of posts, I realized that he was responsible for bringing my favorite style of chant to Western Christendom — a style now known as Ambrosian Chant. Whenever I speak about political power and the Church, I always point to bishops who faced down Emperors over theological issues (like St. John Chrysostom who died in exile after calling out the Empress). One of my favorites was the bishop who dressed down the emperor Theodosius for the massacre of innocents in the city of Thessalonica. The emperor was compelled to do a public penance. Turns out, that bishop was St. Ambrose. When I first became an Orthodox Christian, I was asked by my priest to help him in the altar every Sunday. In our parish, there was a child that grew up seeing me in the altar for entirety of his young life. Therefore, when he saw me in a shirt and tie for the baptism of my first child, he wondered aloud why the priest wasn’t in his robes. I took that as a sign that I should go to seminary. St. Ambrose was led to serve in a similar manner. Born into a political family in Gaul in the year AD 340, he served as a Roman consular prefect in the districts of Liguria and Aemilia in Italy. In AD 374, Auxentius the Arian bishop of Milan died. This brought about conflicts between the Orthodox and Arians over who should become the next bishop. Intending to be a peace maker in his role as a consular prefect, Ambrose set about trying to resolve the issue. It was then that a child cried out, “Ambrose for bishop!” To his shock and dismay, the cry was taken up by the crowd. Not only did he think of himself as unworthy, he was merely a catechumen at the time; however, emperor Valentinian the Elder stepped in and ordered Ambrose to accept ordination. He went on to be an ardent defender of Orthodoxy over Arianism and left us several of his writings. HIs most famous is On the Duties of the Clergy; however, as I stated yesterday, I will be focusing on his meditations on the Holy Spirit. I often have to remind myself (and to preach) that we should not underestimate the ways that the saints affect our lives. The relationships we have with them go much deeper than we expect. 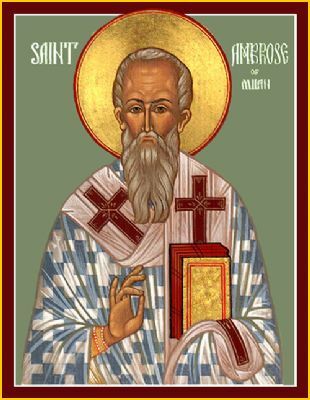 Certainly, St. Ambrose is an example of that in my own life. I pray he will prove to be so for you as well. Amen.